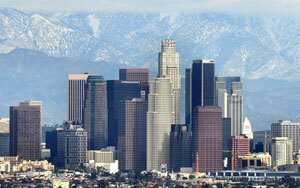 Los Angeles is the largest and extensive city in California is the second largest U.S city by number of inhabitants. Founded in 1781 by Spanish governor Felipe de Neve with the name of The People of Our Lady Queen of Angels of Portiuncula. Los Angeles tourism is one of the largest cultural, scientific, economic and entertainment city in the world. It was twice hosted the Olympic Games (1932 and 1984), as Miss Universe 2006 contest also is home to many cultural and scientific institutions. Los Angeles has a total area of 1.290.6 km ², of which 1,214.9 km ² is land, and the rest (75.7 km ²) water. This makes it the fourteenth largest city in the United States. The highest point is Sister Elsie Peak. Located northeast of San Fernando Valley and has a height of 1,548 m. The Los Angeles River is the main river begins in the Canoga Park neighborhood and is largely seasonal. This river empties into the Pacific Ocean and is almost completely covered with concrete. Due to its location on the Pacific Ring of Fire, Los Angeles is a city exposed to earthquakes. The city has a Mediterranean climate or subtropical. Usually the weather is mild and dry in all seasons, with 325 days of sunshine a year. The Pacific Ocean breezes tend to keep the coastal communities of Los Angeles cooler in summer and warm in winter, the interior, in the summer may be differences in temperature to 10 ° C between them. The Los Angeles area is rich in native plant species, due in part to its diversity of habitats, including beaches, marshes and mountains. The most common botanical environment is coastal scrub, which covers the hillsides. The city is divided into many neighborhoods, many of which were towns annexed by the city's growth. There are several independent cities around Los Angeles, which are considered part of it because of its proximity. Generally, the city is divided into the following areas: Downtown, East Los Angeles, not to be confused with East LA which is an unincorporated community in the county of Los Angeles, South Los Angeles, the Port, Hollywood, Wilshire, West Los Angeles, San Fernando Valley, San Gabriel Valley, Santa Clarita Valley and Antelope Valley. Some well-known communities in the region include the Los Angeles central business district, Century City, Los Feliz, Silver Lake, Hollywood, Hancock Park, Koreatown, and the affluent neighborhoods and towns of the West Los Angeles and Bel Air, Westwood and Brentwood. Los Angeles are home to various entertainment industries such as music, film, television and art. The film industry is one of the most important within the city, especially in Hollywood. Several organizations dedicated to film appreciation have their headquarters in Los Angeles, including the Academy of Motion Picture Arts and Sciences in Hollywood and the American Film Institute. The music industry of the city is one of the most important international recognition. The Capitol Records building is one of the architectural icons of the city. One of the largest highway systems in the world is in Los Angeles, millions of users daily pass, covering 160 million km. The city also has a large number of cars (1 for every 1.8 people). Los Angeles has an extensive system of bus lines, metro and light rail. The metropolitan area of Los Angeles has more airports than any other city in the world. There are six commercial airports and many other general aviation. The main airport of the city is the Los Angeles International Airport. Being the world's fifth busiest airport and the third commercial traffic in the United States each year has more than 61 million passengers and 2 million tons of cargo. The Port of Los Angeles is located in San Pedro Bay in the district of San Pedro, about 30 miles south of downtown. The port covers an area of 30 km ² including land and water, and 69 km of quays. It is located next to the Port of Long Beach. Unlike other cities, Los Angeles has no defined urban center. It is a collection of different communities together by a complex network of roads and highways. Each community has a different personality and particular. Among them are the huge metropolitan complex of Los Angeles. To travel by these scattered neighborhoods, Los Angeles has created a magnificent system of wide streets and avenues that include highways 10 to 14 lanes. This will allow you to travel quickly through this huge urban complex. You should try to avoid traveling on the highways from 7 to 9 am and 4 to 6 pm, when millions of cars made the trip to and from work and highways are filled.